Over the next decade, solar electricity will let consumers get cheaper energy from their rooftop than from their utility. Among the upheaval in the electricity system, the coming of solar “grid parity” means re-thinking incentives for solar energy. 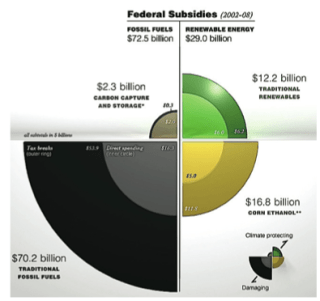 The success of solar is remarkable, no less because the amount of federal subsidy in absolute terms has been far less for renewable energy than for fossil fuel resources (see graphic below).1 As the cost of solar drops toward – and below – grid parity, the question is how to adjust solar subsidies appropriately. Should they be eliminated immediately? Phased out? Or shifted from reducing the upfront cost to some other solar-boosting strategy? This is the fifth of five parts of our Rooftop Revolution report being published in serial. Read Part 1 or Part 2 or Part 3 or Part 4. Download the entire report and see our other resources here. Eliminating solar subsidies makes little sense as it could severely constrain the expansion of solar just as it becomes grid competitive. It will mean short-term grid parity for the sunniest (or most expensive electricity) regions and leave the rest of America out in the cold for many years, hardly a prescription for increasing clean energy and democratizing the electricity system. It could also severely damage the domestic solar industry with a boom and bust cycle, a poor return for one of the few growth industries in the recent economic downturn. It also makes little sense for Americans to be providing incentives for established fossil fuel industries that make billions in profits each year. But keeping solar subsidies – like the 30% federal tax credit – unchanged after its 2016 expiration date also seems senseless. Solar developers in sunny regions like California or high electricity price areas like New York will get out-sized returns from installing solar even as solar reached grid parity in the rest of the country. Furthermore, the tax incentive system continues to create friction by preventing cities, schools and other non-taxable entities from using federal incentives. The guiding principle for solar subsidies should be to continue the enormous strides toward democratizing the electricity system by maintaining the growth of distributed solar while maximizing local ownership and economic benefit. The solar subsidy level should also be reduced (assuming costs continue to decline) when the current tax credit expires in 2016. Reducing the 30% incentive by 3 percentage points per year would allow moderately sunny areas to continue solar growth without over-rewarding the sunniest regions. 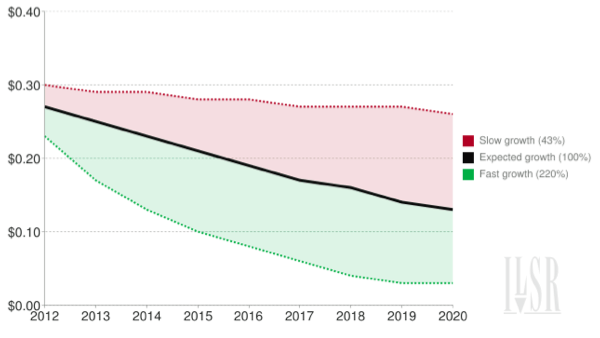 The incentive would expire fully at the end of 2026 (the year before Seattle finally reaches grid parity). The following chart shows that even with exponential growth in solar installations, a phase out would cap the impact on taxpayers. The phase out could be further enhanced by linking the subsidy cuts to the number of solar installations, price indices or the local solar resource. Strong market performance could reduce prices faster while slow growth could mean slower price decreases. Flat electricity prices or a plateau in solar costs could slow the phase out, while high price inflation or large decreases in the cost of installing solar could accelerate it. Sunny areas like Los Angeles could have the tax credit immediately cut to 10% in 2017, while less sunny areas like Ohio could keep the 30% credit a bit longer. Many of these concepts are already included in one of the world’s leading solar policies: a feed-in tariff. This solar financing tool is not a tax credit, but is a combination of a long-term contract, a guaranteed grid connection, and a contract price sufficient for a modest return on investment. The contract provides secure financing for solar projects, reducing borrowing costs and the total cost of solar electricity. The following chart illustrates the concept. A project with a feed-in tariff (FIT) contract in 2011 gets paid a fixed rate per kWh over 20 years (the green line). The project’s revenue is higher than the levelized cost of solar (red line), and the area between these lines indicate the project’s return (blue shaded region). Since the feed-in tariff contract price falls each year, by 2016 an eligible solar project would get a much lower payment (orange line), commensurate with the falling cost of solar (yellow line). The project’s return on investment is the area between the two (pink shaded region). Feed-in tariffs provide several potential advantages over a tax credit. Unlike the federal tax credit, feed-in tariff contract prices follow the falling cost of solar. Without change, the federal tax credit could offer very high margins to solar power developers in Southern California and other places where inexpensive solar competes with expensive electricity. But the contract price of the German feed-in tariff has fallen each year, in accordance with the size of the solar market (much like California’s Solar Initiative production incentive). When the market is particularly strong, the price falls faster; if the market is weak, the price declines slower, creating a “growth corridor.” The following chart illustrates the concept. Second, the German feed-in tariff has been changed in recent years to encourage more on-site use of solar power. Individuals and businesses with on-site solar can install a separate meter to track actual on-site use of solar electricity produced from their array, and receive bonus payments if it serves a higher portion of their load. The Germans hope the policy will encourage the installation of on-site storage, because the more electricity is kept on-site, the higher the payments. In contrast, American net metering policy simply reconciles solar electricity production with grid electricity consumption, on-site use is coincidental. The feed-in tariff also solves the tax credit problem for the public sector, because the long-term contract is available to anyone, not just taxable entities or large corporations with tax equity. It also allows more individuals to install and finance solar without needing a solar leasing arrangement (although that remains an option). This can increase local ownership of solar, and with it, the economic value of distributed solar power for communities it serves. Another spin on the feed-in tariff may be Minnesota’s recently adopted “value of solar” policy. If implemented by eligible utilities, it would provide solar producers with a 25-year, fixed price contract for their power production, paid as an electricity bill credit. Since there are potential legal and political hurdles to implementing a full feed-in tariff program in the United States, a compromise policy might be a “Feed-In Tariff Lite.” Instead of providing the full contract price, the existing federal solar subsidy could be converted to a production payment that would cover the difference between a regionally appropriate contract price for solar (sufficient for the owner to earn a modest return on investment over 20 years) and the local net metering rate. Note: the following chart is based on late 2012 solar energy prices, much higher than today’s. The following chart illustrates how the payments would be relatively small in regions with ample sun and high electricity prices (and net metering rates). Payments would be larger in places like Seattle, where cheap electricity and more moderate sunshine dominate. Since the value of net metering tends to rise with electricity prices (2% per year in our assumptions, although actually 4-5% per year for most utilities over the past decade) and the cost of solar is falling (at 7% per year), using this program won’t be particularly expensive. If the federal government provided the margin for solar projects on a 20-year contract, and supported every solar project in the next 10 years based on the growth expectations we used earlier, the program’s peak cost would be under $20 billion in 2021, supporting 160 gigawatts of solar. This is in comparison to the current 30% tax credit, which cost over $3 billion in 2011, in support of 1.7 gigawatts of solar. 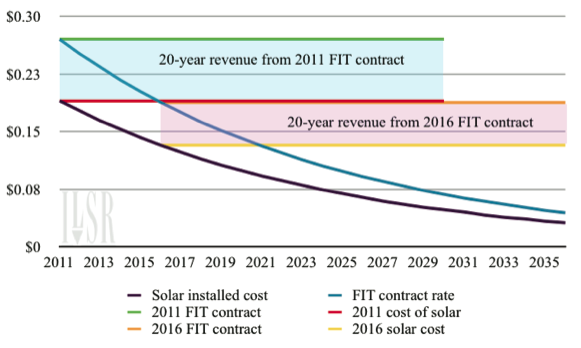 The above chart shows the cost of the FIT Lite program over the next 30 years (projects coming online in 2021 would have contracts through 2040). 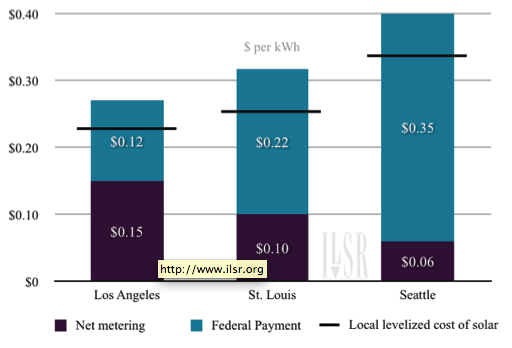 We used the cost of solar and net metering rates for St. Louis as a proxy for the entire country. The explosive growth of solar power has created a convergence of solar and grid electricity prices. Within the next few years, millions of Americans will have a local, cost-effective, and cleaner alternative to grid electricity. The coming of solar grid parity opens an enormous opportunity for democratizing the electricity system via thousands of distributed solar power systems. Unlike traditional electricity generation – centrally planned and centrally owned by large, private utilities – solar on residential rooftops across the United States can open the electricity system to widespread ownership of decentralized solar energy systems. The economic benefits of the transformation would likewise be widely spread. Technical and political barriers remain, but are surmountable. 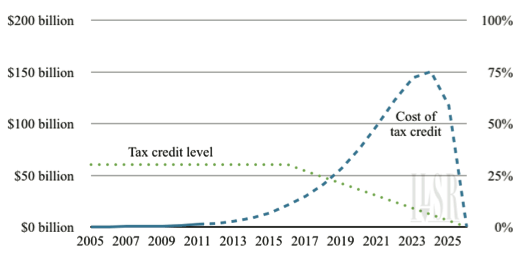 The most serious barrier is the potentially serious disruption posed by the looming expiration of the federal 30% tax credit (in 2016). A thoughtless extension will enrich solar developers at the expense of taxpayers; an abrupt expiration will seriously affect the solar market in the many regions that have not reached solar grid parity by 2016. A hybrid policy approach is needed, whether to phase out the federal tax credit in a fashion that is geographically equitable or to shift to a feed-in tariff strategy to be more comprehensively prepared for the economic issues of grid parity. Guidelines for limiting distributed generation on local electricity systems can be modernized, vetted by data from actual solar power plants, and the limits raised. Already, public utility commissions are considering changes to the 15% rules to allow more solar power on distribution systems, and further research may reveal even greater potential without significant upgrades to the electric distribution system. Policies like net metering have provided a simple accounting method for financing on-site solar power and can be improved by allowing for community net metering, lifting aggregate demand caps, and providing policy alternatives like feed-in tariffs. The coming of solar grid parity portends an enormous opportunity for citizens to become more energy self-reliant, to become power producers themselves, and to transform the grid to a decentralized and democratized electricity system.